The perception within the education sector is often that search engine optimisation is just not needed. And indeed there is some justification to this. Whether you are an independent, state funded or free school, many of the SEO bases are naturally covered without having to put any leg-work into it. There will be strong inbound links from government and local authorities, a natural awareness within the local community through events and projects, and a huge amount of naturally generated “chatter”, both in person and via social networks, by both pupils and parents. On top of this, if you are a state school, you will also have a .sch.uk domain name which carries considerable authority in search algorithms. So, given a profile and social coverage that is the envy of commercial organisations, and an effortless page 1 ranking for your school’s name, should you put any effort into SEO? 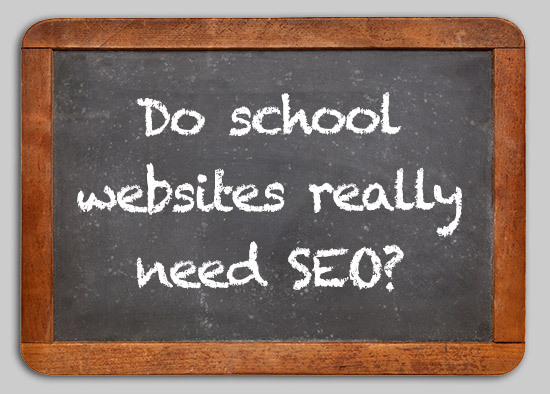 Search Engine Optimisation is not just about being #1 in search results for your school’s name. Remember the following and consider again whether your school might benefit from SEO and some digital marketing wizardry. For many people, their first visit or interaction with your organisation will be via an Internet search and you only get one chance to make a good first impression. But don’t assume a parent will simply type in the name of your school and be sent directly to your website. Might they search for schools in the local area, best private schools or even via Ofsted Reports or newspaper reports? Type in a few alternatives and see where you rank? Just a few simple SEO techniques could ensure that, whatever they type, you always remain number 1. Selecting the right school for a child is a hugely important affair for parents, a task that will involve a vast amount of research and deliberation for most. The school has to have a good reputation but also must fit the needs of the child in question. You may be competing against several other schools in the local area, all with equally good reputations, and, if you are an Independent school, you may be competing nationally or even internationally. Ensuring you are optimised will give you the edge with today’s tech-savvy, time poor parents. Gone are the days where internet searches are done solely from a desktop computer. One in two people now use a tablet or Smartphone while watching TV and 53% of UK mobile users used their mobile first to search for information, before following up on another device. Ensure your website is responsive, meaning it can be viewed on a variety of different devices in the best format for that device. Google will give priority for searches made on mobile devices to mobile-optimised websites, so ensure if a mum is browsing on her mobile in the school playground, you still remain ahead of the pack. Don’t assume a parent will rely purely on your website and a glossy brochure to make their decision. We live in a digital-savvy world and most adults are aware that messages and images are controlled and contrived in marketing literature, including websites. Be aware of all the different places where people conduct searches, for example, Google Places, Google + Local, Google Maps and Bing Places / Bing Local. Also be aware that depending on the location of the searcher and the device they are using, there is a high chance that they will come across these listings before they reach your website. Taking Google as an example, even if you have not set up your listings in these areas, you will still appear there anyway because Google generates them automatically. So, if Google has generated your listing automatically, then it may not be representing you the best light possible. By looking at the Google + and Google Maps listings for some of the most acclaimed schools in the country, the point is illustrated perfectly. Often schools haven’t taken ownership of their listings meaning they have no control over how they are represented. The images often do not look good, the descriptions taken from Wikipedia (which is notoriously inaccurate) and there are often prominent links to poor reviews, which are simply going unregulated as they are not managed by the school itself. Consider that this could be the first impression from a perspective parent.